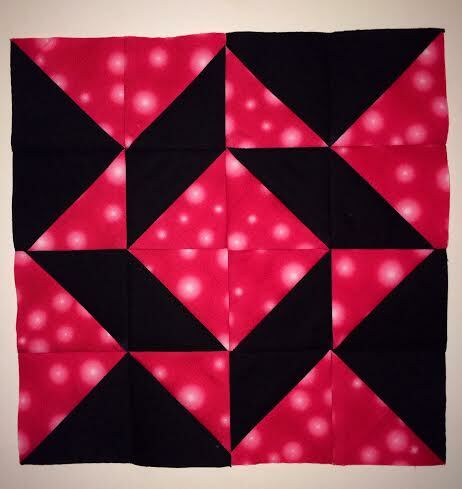 Be the first to know about sales/freebies, and get new free strip quilting patterns! Enter your email below. You can unsubscribe at any time! 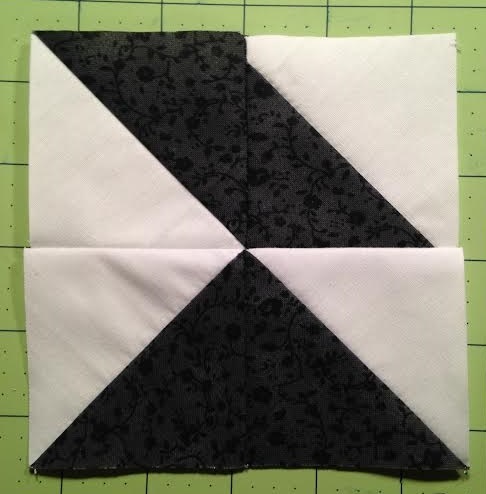 Hey quilters! Happy Saturday (well... it's actually Friday night for me!) 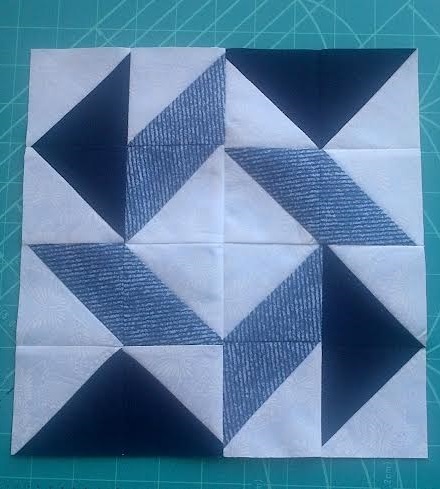 - here's Block 3 of the HST Challenge. 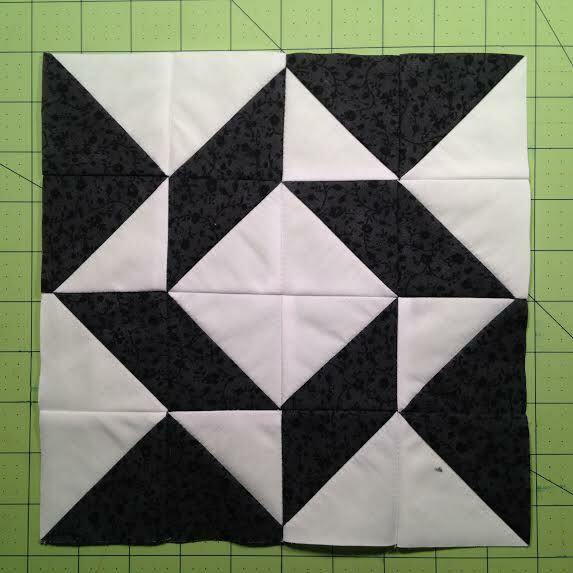 This is another block that looks great monotone, or using two different fabrics. 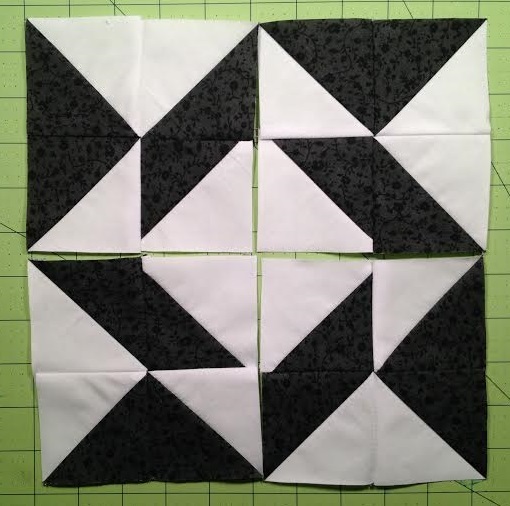 I've put together another Pinterest board with lots of examples - I'll be doing mine monotone, but you can easily "borrow" 8 HSTs from another week if you'd like to make the 2-fabric version! Remember the components from Week One's block? They're the same - just sewn together in the opposite order. 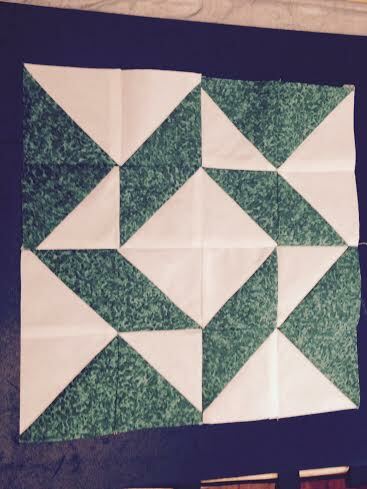 You'll need 4 of the flying geese blocks, and 4 of the blocks with a diagonal going from upper left to lower right. 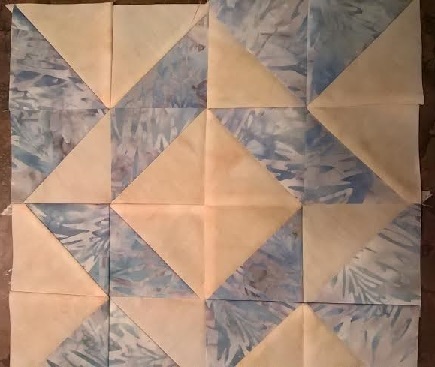 You'll have a 1/4" seam allowance on the top and bottom of the middle of your diagonal block, and a 1/4" above the point in your flying geese. 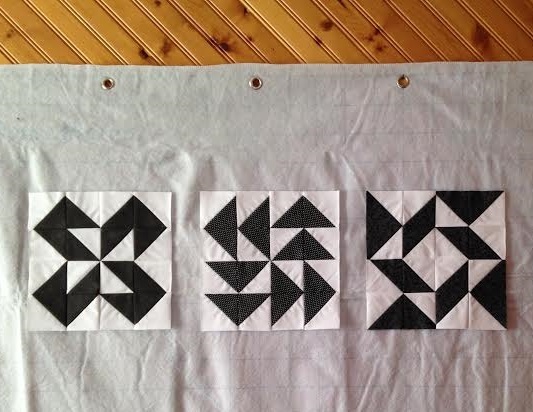 Press your flying geese open to the left and your diagonals to the right (they're actually reversible, but let's just make it easy!). 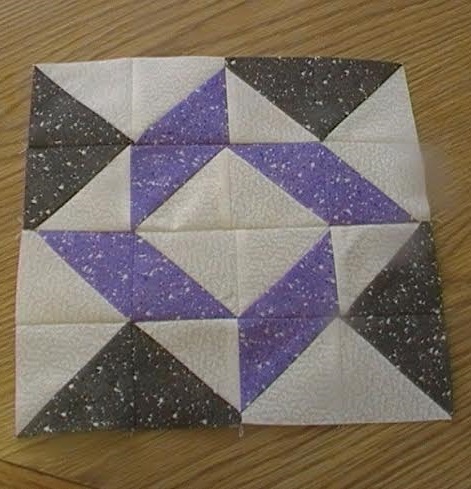 Join one flying geese block with one diagonal block - flying geese on the bottom, point up- to make the block below - make all 4 the same. 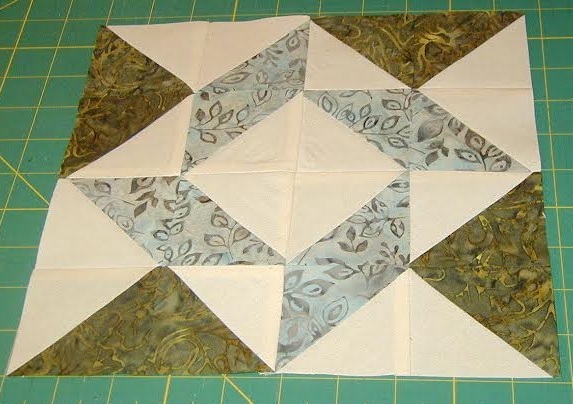 Press open toward the flying geese block. Now arrange your 4 blocks into the Balkan puzzle layout... lower left, your flying goose will be point up, upper left, it'll be pointing right, upper right, it'll be pointing down, lower right, it'll be pointing left! 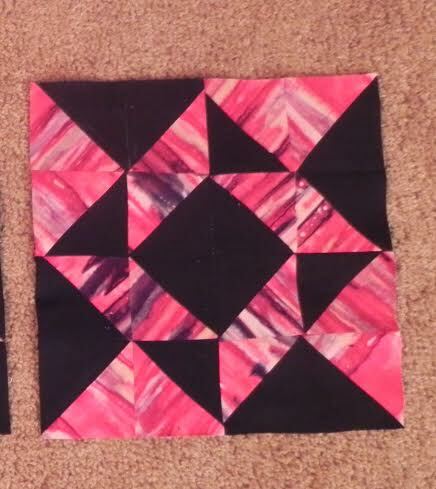 Now join them together into your finished block! 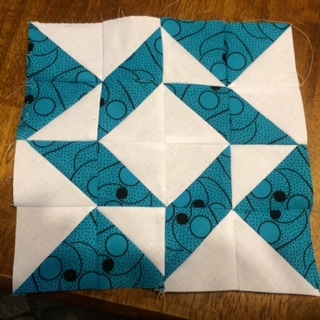 I really love this block! 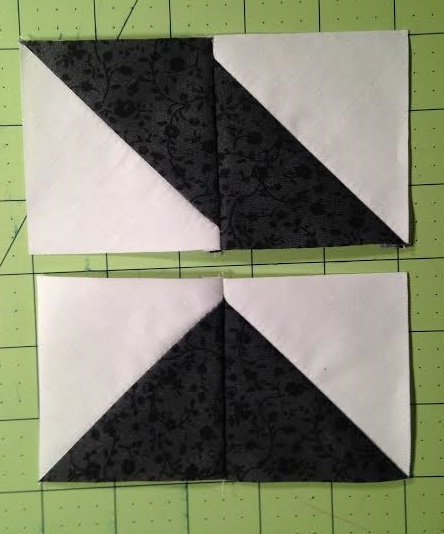 If you want to use two different fabrics, you'll make your flying geese in one fabric, and your diagonals in another. That's it! Everything else is the same! Check out my blocks on my "design wall"! I'm loving this project so far! By the way - if you don't have a design wall, but you do have a 60" x 72" space on your wall, can I just recommend this awesome thing above? It's a Fons & Porter felt design wall that just hangs on any wall and is awesome for placing blocks. I wish I'd gotten this about 20 years ago - it's only $15 on Amazon! Here this whole time, I'd been thinking I needed something expensive. The blocks just stick right to it. So cool. Debby's version and her 3 so far! Katie's versions and all 3 so far! Deborah S's version and her 3 side by side! 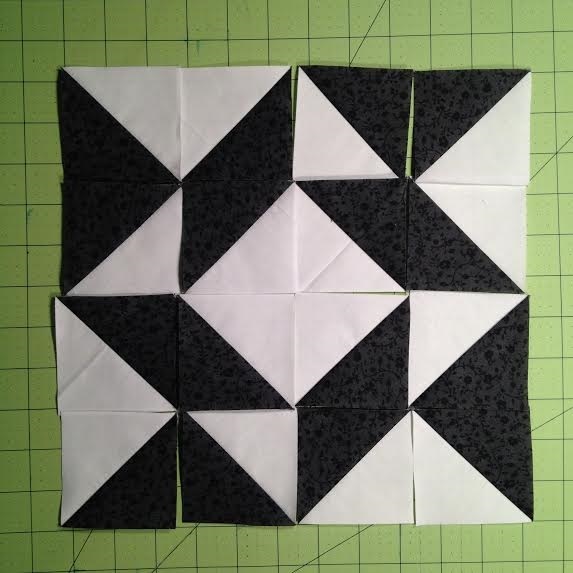 Seeing the 3 block on your design wall makes me want to do a quilt in black and white and using the different blocks. 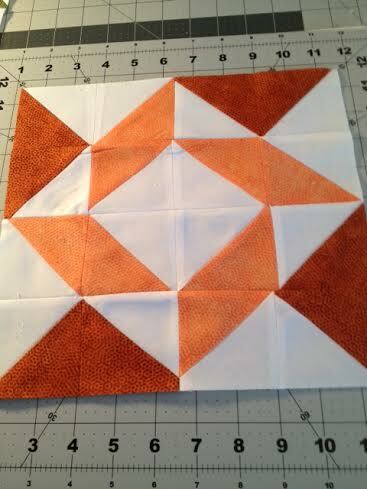 This block is very interesting and I don't like angles but with the half square triangle it is been pretty easy. Ready for the next one. Mine are all in different color. Hi...have just ordered my hts bundle. Yesterday I walked about a mile through a snow storm to get my cutting board,ruler, and rotary cutter. I can't wait to get started. 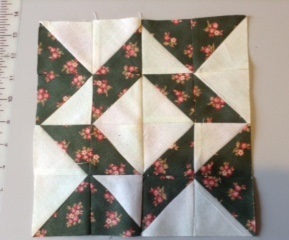 I'm 80 years old, have lots of time on my hands.I've made 2 race quilts from your jelly rolls and ilove your fabrics.I live in boulder colorado . So excited! I started out behind but am finally caught up! Can't wait until next Saturday! 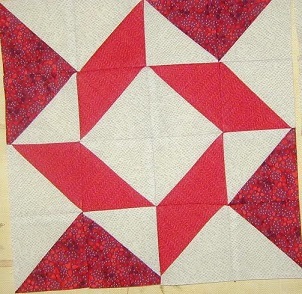 I am using the red jelly roll and am having problems with the deep reds transferring onto the white when ironing seams. I've always set my iron at cotton and never had that problem with the other jelly rolls...any ideas as to what is going on or how to get rid of the pink tinges in the seams? 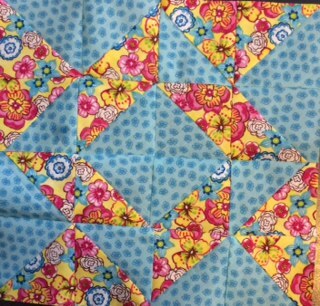 Sharlene, That is dedication to your love of quilting! lol I would of done the same thing though. 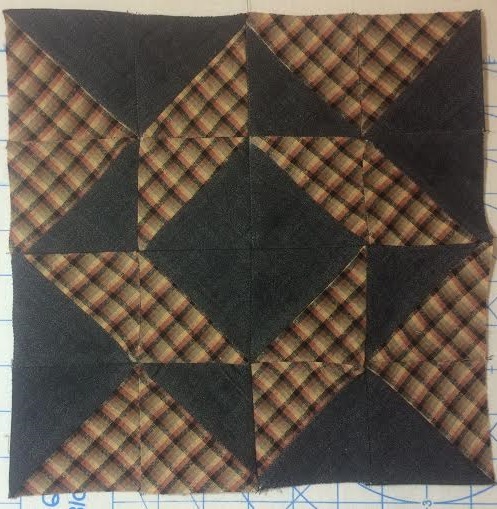 I can't imagine having my quilting tools too far away from me. Have fun with the challenge. 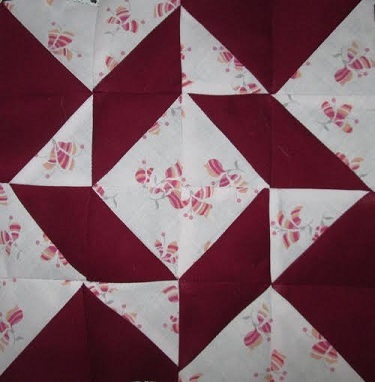 Hi Liz The fabrics used in Katies quilts, do you carry it? I would sure like to buy some. It's really very pretty. Roslyn unfortunately we do not! I will ask her what they are for you! 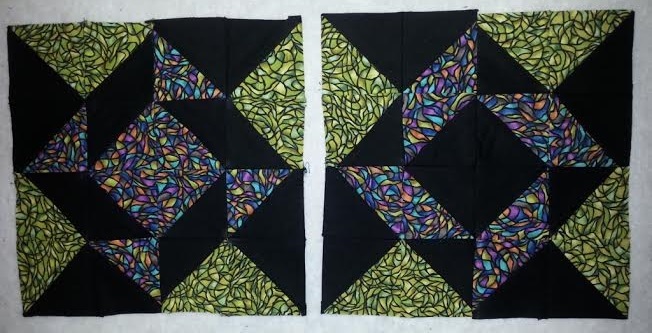 Katie - I love your blocks - they remind me of stained glass! Very pretty! Hi Karen! The link to the fabric bundle is at the top of this post - and the link to more info on the tutorial is on the bundle's page. 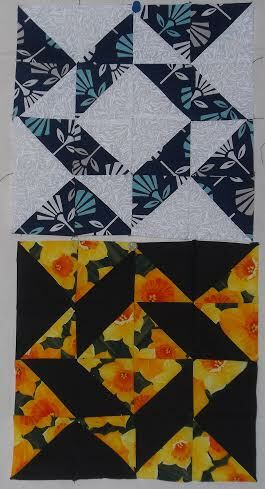 :) It's 25 blocks in 25 weeks, one "surprise" block each week, and the finished quilt top (including sashing) is approx. 57" x 57". 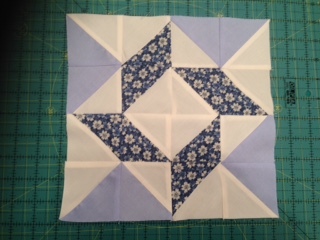 Have just finished the first 3 blocks, will do the 4th block tomorrow. I have never done anything like this before, and my points ( ducks ) are not all in a row but it's great fun. I've done a lot of ripping out and do overs but that's not so bad and I'm learning a lot. Your diagrams and instructions make it so easy to understand. Kudos to you Liz. 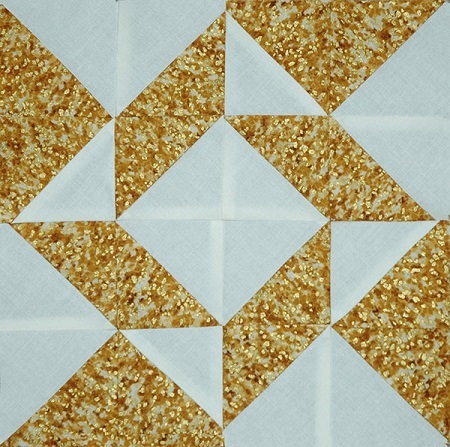 I am a beginning quilter and have never done anything like this challenge. I am having a ball. Worked ahead and got all the HST done for the 25 weeks. 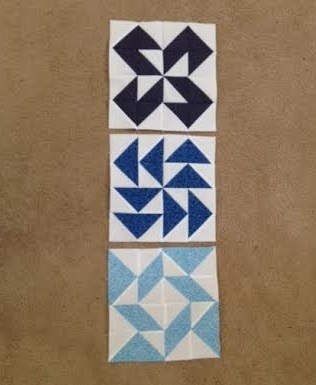 I am making 5 of each block as to make a queen size quilt. I wait for Saturday mornings now to get my next block. Thanks for everything. You have made this so fun. Wow, Barb! 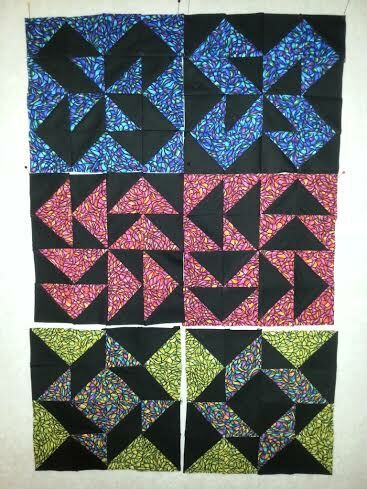 That's a LOT of HSTs, you've been busy! :D So glad you're enjoying it! Hi, Liz! This is so great. Can you please tell me how large I should square up each block when I'm done? Thanks. I am ending up with having to clip both ends of my HST. I have followed your tutorial step by step & have been very precise about my measurements. I followed your link on how to press them . What am I doing wrong? 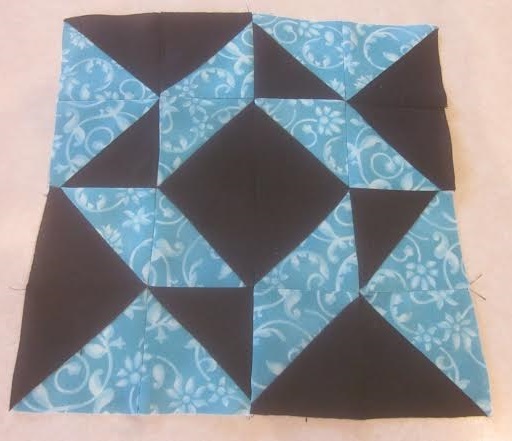 HALF SQUARE TRIANGLE CHALLENGE QUILT BLOG! 2016 HST Challenge Week 25 - Final Instructions! 2016 HST Challenge Week 24 - Bermuda Triangle! 2016 HST Challenge Week 23 - Stargazer! 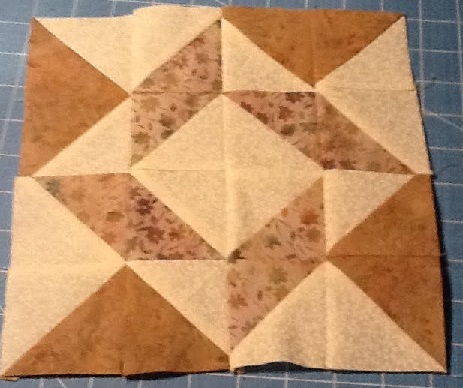 2016 HST Challenge Week 22 - Rosebud! 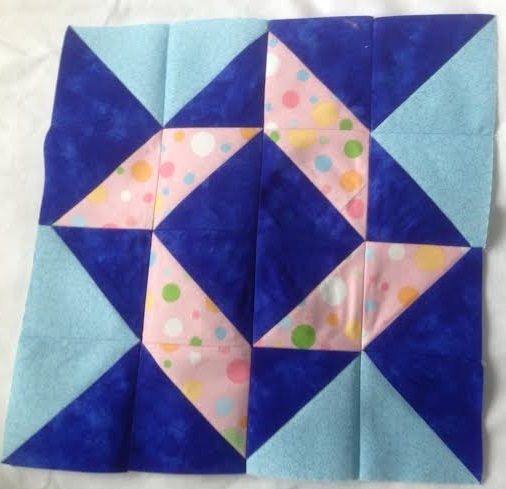 2016 HST Challenge Week 21 - Super Spin! 2016 HST Challenge Week 20 - Hourglass! 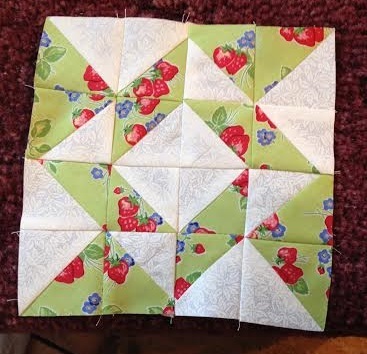 2016 HST Challenge Week 19 - Peony Bud! 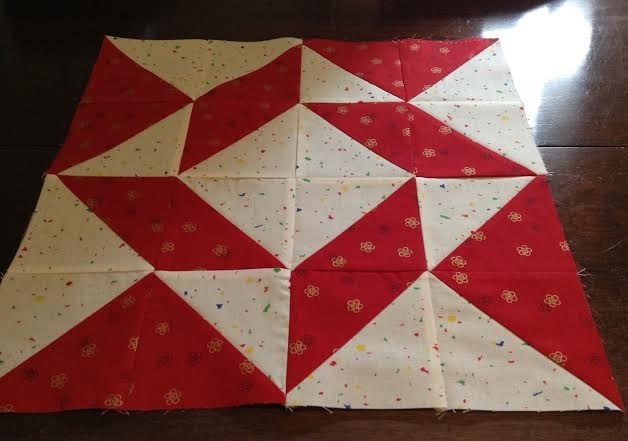 2016 HST Challenge Week 18 - Whirlwind! 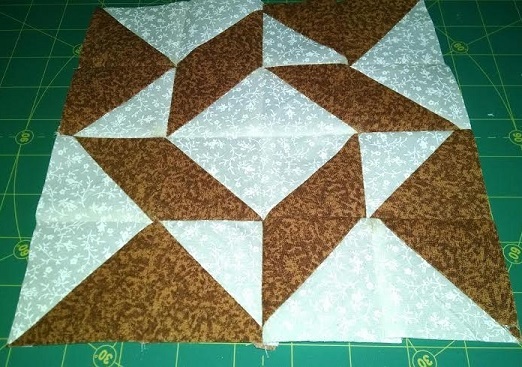 2016 HST Challenge Week 17 - Boxy Star! 2016 HST Challenge Week 16 - Sweet Sixteen! Copyright JellyRollFabric.Net. All Rights Reserved.